The new ING Bank in Aalst, Belgium needed a premium waterproofing solution for the foundation retaining walls as well as a first-class waterproof sealant for all of the pipe penetrations. This newly built bank’s retaining walls needed a premium waterproofing membrane to protect the building for decades from moisture damage. The client wanted a membrane solution that is highly flexible, yet durable and puncture resistant. They wanted to ensure that even when the concrete walls crack and settle, the membrane would remain watertight and prevent leaks. They also had 37 pipe penetrations inside and outside of the retaining walls that needed to be sealed tight. 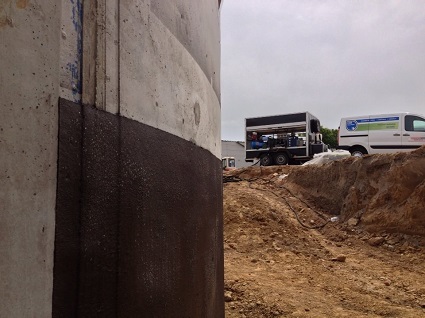 CDR Solutions of Belgium recommended the retaining walls be primed and sprayed with the instant-set TRITOflex liquid rubber waterproofing membrane at 1.5mm (60 mils) dry. TRITOflex is environmentally-safe, water-based, and has no disruptive odors. With the highest adhesion ratings on concrete in the industry, this seamless rubber membrane provides ultimate protection. It also is spray applied to any desired thickness in just one coat, so installation was quick and allowed for the next phases of construction (drainage mat and back-filling) to be completed sooner than normal for below-grade waterproofing projects. In addition, TRITOtrowel brush-applied liquid rubber compound was used to seal the 37 pipe penetrations and provide a watertight seal with an extreme bond to the surfaces. The bank received a quick installation of the first-class TRITOflex waterproofing membrane on all of the retaining walls and TRITOtrowel waterproofing sealant around all the new pipes. A drainage mat was then installation directly on top of the TRITOflex membrane and then back filled against. The bank can now rest assured that their foundation will remain watertight for decades to come, even when the ground shifts and the concrete cracks. Their new investment is protected well with the TRITOflex system. !